Anxiety and eating disorders are both psychological illnesses. Anxiety disorders affect around 40 million adults in the United States on average. Anxiety is a psychological state that is defined by the exaggerated, persistent feeling of worry, tension, and nervousness. Anxiety disorders include generalized anxiety disorder, panic disorder, and obsessive compulsive disorder. Eating disorders are characterized by abnormal eating habits - either insufficient or excessive food intake - that are detrimental to the individual's health. Eating disorders include anorexia, bulimia, and binge eating disorder. 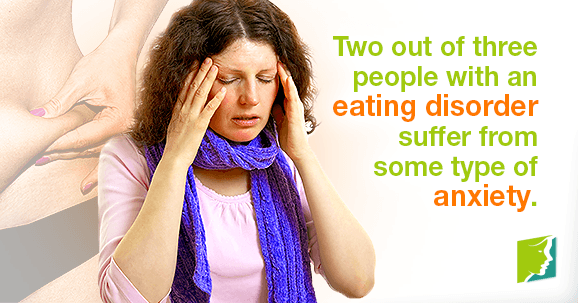 In many cases, there is a direct link between anxiety and eating disorders. Anxiety can cause a myriad or symptoms, and can be either physical or psychological. Physical symptoms can include sweating, dizziness, increased heart rate, shortness of breath, muscle tension, insomnia, and headaches. Psychological symptoms can be anything from feelings of dread and intense fear, restlessness, and irritability to anticipating disaster. The primary cause of anxiety disorders in middle-aged women is hormone fluctuations experienced during menopause. A woman's estrogen levels waver, drop, and then stay consistently low during the menopause transition. Additional factors that can trigger anxiety include high stress, genetics, certain medications, emotional trauma, lack of exercise, and poor diet. Eating disorders are defined as abnormal, unhealthy eating habits. They are typically fueled by low self-esteem. Anorexia is characterized by the severe restriction of food in fear of gaining weight, even if the sufferer is underweight. Bulimia is described as binge eating followed by throwing up. Binge eating is when someone eats an excessive amount of food and genuinely cannot control how much they eat. Anxiety and eating disorders often go hand-in-hand. Researchers have found that two out of three people with an eating disorder suffer from some type of anxiety disorder at some point in their lifetime. Anxiety typically comes first, and eating disorders stem from it, most likely because of the urge to be able to control everything. It becomes a vicious cycle because people with eating disorders then experience anxiety about gaining weight, eating, body image, and how to hide their eating disorder behaviors. Since anxiety and eating disorders are closely linked, they should be treated together. Therapists are typically familiar with both of these psychological illnesses and can help analyze and treat them simultaneously. Cognitive behavioral therapy and psychotherapy can be helpful for treating anxiety and eating disorders because they analyze negative thoughts and aim to train you how to think positively. This type of talk therapy is geared toward solving immediate problems. Prescription medications and support groups can also be beneficial when treating anxiety and eating disorders. Anxiety and eating disorders are both psychological illnesses that typically go hand-in-hand; two out of three people with an eating disorder also suffer from anxiety. It becomes a vicious cycle, because anxiety is usually the root of eating disorders, and then people get anxiety about body image and trying to hide their disorder. It is important to be able to recognize if you or a loved one has either of these disorders in order to seek professional treatment as soon as possible. Read about good habits for anxiety episodes.